Life & Character - Isaac Newton was born prematurely on Christmas day 1642 (4 January 1643, New Style) in Woolsthorpe, a hamlet near Grantham in Lincolnshire. The posthumous son of an illiterate yeoman (also named Isaac), the fatherless infant was small enough at birth to fit 'into a quartpot.' When he was barely three years old Newton's mother, Hanna (Ayscough), placed her first born with his grandmother in order to remarry and raise a second family with Barnabas Smith, a wealthy rector from nearby North Witham. Much as been made of Newton's posthumous birth, his prolonged separation from his mother, and his unrivaled hatred of his stepfather. Until Hanna returned to Woolsthorpe in 1653 after the death of her second husband, Newton was denied his mother's attention, a possible clue to his complex character. Newton's childhood was anything but happy, and throughout his life he verged on emotional collapse, occasionally falling into violent and vindictive attacks against friend and foe alike. With his mother's return to Woolsthorpe in 1653, Newton was taken from school to fulfill his birthright as a farmer. Happily, he failed in this calling, and returned to King's School at Granthan to prepare for entrance to Trinity College, Cambridge. Numerous anecdotes survive from this period about Newton's absent-mindedness as a fledging farmer and his lackluster performance as a student. But the turning point in Newton's life came in June 1661 when he left Woolsthorpe for Cambridge University. Here Newton entered a new world, one he could eventually call his own. In 1665 Newton took his bachelor's degree at Cambridge without honors or distinction. Since the university was closed for the next two years because of plague, Newton returned to Woolsthorpe in midyear. There, in the following 18 months, he made a series of original contributions to science. As he later recalled, 'All this was in the two plague years of 1665 and 1666, for in those days I was in my prime of age for invention, and minded mathematics and philosophy more than at any time since.' In mathematics Newton conceived his 'method of fluxions' (infinitesimal calculus), laid the foundations for his theory of light and color, and achieved significant insight into the problem of planetary motion, insights that eventually led to the publication of his Principia(1687). In 1666, as tradition has it, Newton observed the fall of an apple in his garden at Woolsthorpe, later recalling, 'In the same year I began to think of gravity extending to the orb of the Moon.' Newton's memory was not accurate. 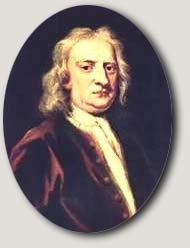 In fact, all evidence suggests that the concept of universal gravitation did not spring full-blown from Newton's head in 1666 but was nearly 20 years in gestation. Ironically, Robert Hooke helped give it life. In November 1679, Hooke initiated an exchange of letters that bore on the question of planetary motion. Although Newton hastily broke off the correspondence, Hooke's letters provided a conceptual link between central attraction and a force falling off with the square of distance. Sometime in early 1680, Newton apprears to have quietly drawn his own conclusions. Meanwhile, in the coffeehouses of London, Hooke, Edmund Halley, and Christopher Wren struggled unsuccessfully with the problem of planetary motion. Finally, in August 1684, Halley paid a legendary visit to Newton in Cambridge, hoping for an answer to his riddle: What type of curve does a planet describe in its orbit around the sun, assuming an inverse square law of attraction? When Halley posed the question, Newton's ready response was 'an ellipse.' When asked how he knew it was an ellipse Newton replied that he had already calculated it. Although Newton had privately answered one of the riddles of the universe--and he alone possessed the mathematical ability to do so--he had characteristically misplaced the calculation. After further discussion he promised to send Halley a fresh calculaiton forthwith. In partial fulfillment of his promise Newton produced his De Motu of 1684. From that seed, after nearly two years of intense labor, the Philosophiae Naturalis Principia Mathematica appeared. Arguably, it is the most important book published in the history of science. But if the Principia was Newton's brainchild, Hooke and Halley were nothing less than midwives. When Halley visited Cambridge in 1684, Newton had already demonstrated the relation between an inverse square attraction and elliptical orbits. To Halley's 'joy and amazement,' Newton succeeded where he and others failed. With this, Halley's role shifted, and he proceeded to guide Newton toward publication. Halley personally financed the Principia and saw it through the press to publication in July 1687. Cohen, I. Bernard, The Newtonian Revolution (Cambridge 1980). Dobbs, Betty J., The Foundation of Newton's Alchemy: The Hunting of the Greene Lyon (Cambridge 1975). Hall, A.R., Philosophers at War: The Quarrel Between Newton and Leibniz (Cambridge 1980). Herivel, John, The Background to Newton's Principia (Oxford 1965). Koyré, Alexandre, Newtonian Studies (Harvard U. Press1965). Manuel, Frank E., A Portrait of Isaac Newton (Harvard U. Press 1968). Manuel, Frank E., The Religion of Isaac Newton (Oxford 1974). Westfall, Richard S., The Construction of Modem Science: Mechanisms and Mechanics (Willey 1971; CUP). Westfall, Richard S., Never at Rest: A Biography of Isaac Newton (Cambridge 1980). of the Encyclopedia Americana. The current edition (1998) citation is EA 20: 288-292. Reproduced in Luminarium with express written permission of the author. Created by Anniina Jokinen on June 27, 2000. Last updated on July 19, 2007.